Though I fear it has been too long in coming and will be a bit underwhelming, I'd like to try to articulate my own thoughts on the nature and evolution of book reviews: mainstream media, blogs, print, internet, etc. It's like public school funding, the arts are the first ones to take the hit, while the football team gets their new uniforms. It's all about money to the corporations who run the newspaper/magazine industry,not quality vs. quantity. Essentially, we (that is, bloggers and professional book reviewers, the internet and the newspaper) are not each other's enemy. I mentioned some time ago the Wall Street Journal article which observed that publishers' allocation of advertising funds -- that is, spending money to get stacks of bestsellers front and center in chain stores, rather than on advertising in book review pages -- was linked to the demise of the book review pages. I think that factor, and its implication about the increasing consolidation of media companies, has more to do with the struggles of newspaper book review sections than does the emergence of literary blogs. Both the NBCC's campaign to save book editors and the Litblog Co-Op are reactions against the same trend. As a recent author in our store asserted (Eric Klinkenberg, author of Fighting For Air), the trend toward homogenization leads to a counter-trend of fragmentation and uber-indie underground culture. What suffers is the middle ground, the culture that you don't have to be a bourgeois zombie or a hipster of the arcane to desire and consume. With the blame out of the way, I'd love to talk about the strengths and weaknesses of blogs and print. I tend to think of things in terms of bookstores. Both a newspaper book review and a blog review could be said to be more browsable, or more findable, as I've described methods of shelving books. If you're a newspaper subscriber, you might find yourself reading a book review just because it's there, physically in front of you. If you're a web surfer, you might find a literary blog linked from some semi-related site, or you might search for a review of one book and find reviews of another. But you might also find a blogger whose tastes correspond to yours, and read every review they write and buy books based on their recommendations. Or you might read the New York Times or your local paper every week and set your habits by what is recommended there. As the responses to my question seem to indicate, many (if not most) readers find their reviews of books they want to read from a variety of sources, both print and online, professional and amateur and utterly accidental. They find information about books wherever they can. If print options are available and credible, they'll go there. If a blog is speaking their language, they'll listen. I feel unfortunately the "conflict" between bloggers and professional print reviewers has been couched in terms of Elitist Snobs versus Uninformed Masses. That seems pretty stereotypical and unlikely to be true, and I squirm uncomfortably whenever an author or a blogger makes an assertion in such terms. Though the debate may fairly be described as Amateur vs. Professional, the perspective and talent of someone talking about books can really only be accurately discussed on a case-by-case basis. Right? I read a review of a biography of Virginia Woolf in the New York Times where the famous author cutely admitted she had never read any works by Virginia Woolf. (Okay, disclosure: I wrote my undergrad thesis on Woolf, so I'm a little sensitive.) And I've read some impeccably written but sneering blog reviews that cast aspersions on the education and intelligence of an author, their editor, and any reviewer who would dare to praise them. So the Elitist Snob thing and the Uninformed Masses thing can obviously go both ways. There is a difference between getting paid for something and doing it for free. The difference isn't always one of quality, but it is one of filtering. As Andy Laties points out, "because the individual litbloggers don't have the institutional structure within which to operate, their resistance to co-optation by publishers will be less dependable." Having an editor, a format, and a wage makes for a level of impartiality that leads to the "credibility factor" that many authors cited for print reviews. It doesn't always work – lots of writers and reviewers are friends or enemies, of course, on account of they're people who live in the world, and no institution can or should eliminate all personal interest from a book review. Blogs, on the other hand, have the benefits that come from no filter: their passion for or against a book, or their complex thoughts about it, are subject to no one's editing but their own. Most of the litblogs whose reviews are worth reading know more or less what they like and don't tend to write reviews hoping for another free book or a mention in the publisher's catalog. There's no reason for them to write unless they want to, and there's no reason for anyone to read them unless they like what they're writing. That can make for some crazies or duds, but it can also make for some powerful and impassioned writing and some creative ways of talking about books that can't happen in the slower-moving systems of an institution. Finally, I want to address the assertion I've heard, even within the book industry, that people who read blogs don't read newspapers, or even that they don't read books. (I have to try to be articulate and careful, because this statement strike me as so ignorant I can start to see red.) Some people who read blogs on non-book issues perhaps do not read books or newspapers. That is because they are not particularly interested in books, and would be unlikely to read a book review section even if they found it under their plate at a restaurant. 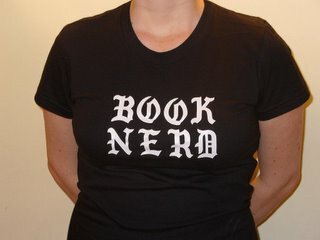 But people who read book-related blogs tend to be people who like to read in general. They are unlikely to read blogs about books and then not read books. And they are very likely to read about books wherever they are able, because that's what they care about. If Web 2.0 means anything, it means less creation of content and more facilitating of conversation, on whatever topic one wishes. The conversation about books on the web is growing louder and more powerful and refining itself and throwing out new branches daily, and it is undeniably having an effect on the world. The strength of newspaper, print, and magazine reviews is not that they are "better" than amateur reviews, but that they take that conversation into another portion of the world. They make the cultural dialogue about books important enough to exist alongside the news and the sports page. They give us touchstones, as the booksellers who responded can attest, that cross demographics and genres and levels of technological comfort. They give legitimacy and structure to the rich thoughts and words about literature that are happening in people's minds and mouths and on their computer screens. Both the existence of literary blogs created by amateurs and the existence of book reviews written by professionals are necessary to a rich literary culture. To put it simplistically, blogs build audiences; print builds credibility. Both would be the poorer without the other. The more we talk about it, the harder it will be for any corporation looking to their bottom line to ignore it. It's all part of the conversation. It may seem a bit Pollyanna-ish of me, but my wish is that reviewers of all stripes would band together like booksellers of all stripes, hanging together so that we do not hang separately. The more we snark about who is more talented or professional and who is undermining who, the more we make book reviewing a vicious and ineffectual backwater in the larger culture, and the less it becomes about the books. If we build on each other to enrich the conversation about literature, we combine grassroots and institutional foundations to create a rich and growing world. There's lots more to say, and I hope it will get said. Feel free to share your agreement, disagreement, or expansion on these thoughts in the comments.